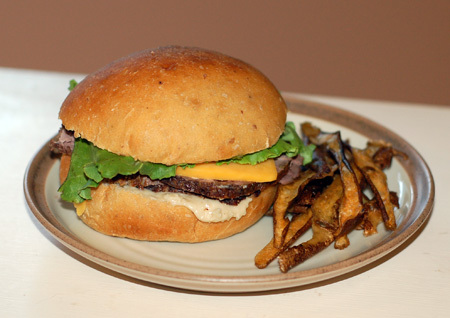 It is starting to be a tradition for us to have beef on the 4th of July, and beef sandwiches on the 5th of July. Last year, we sprung for filet mignon with a porcini crust and gorgonzola butter; I transformed the leftovers into beef sandwiches with homemade potato-chard rolls and caramelized onions. This year Jeremy brought home a 5-pound round tip roast. Good thing the weather still hasn’t quite heated up to summer temperatures here yet: I decided to cook it simply in the oven and made a whole host of sides to go with it, pesto mashed potatoes, butter-braised carrots and radishes, and sauteed greens, plus a gravy made from the pan drippings. Roasting in my convection oven directly on the rack (with a broiler pan underneath to catch all those juices), the meat formed a delicious crust outside but stayed very tender inside, despite my initial reservations that it had overcooked. 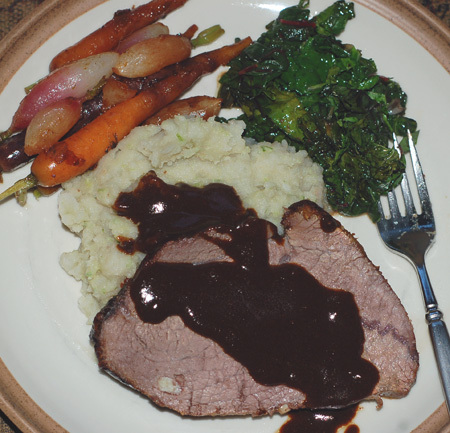 My gravy was a simple combination of red wine and beef broth with the drippings, strained, reduced by about half, and mixed with your basic beurre manié for body and gloss. Beyond the gravy and a pile of mashed potatoes marbled with potent garlic scape pesto, I decided to do a braise of my remaining root vegetables from the farmer’s market, baby purple carrots and French breakfast radishes. Following Molly Stevens’ general method, these were cooked whole with a few tablespoons of butter and about half a cup of homemade chicken stock, covered at a simmer until they were just tender inside, then tossed with a bit of sugar, red wine vinegar, and salt. 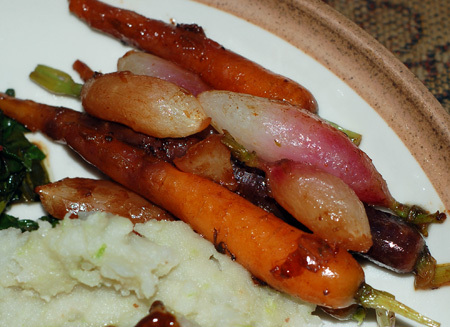 The radishes had a mild, earthy bitterness akin to turnips, so they were well matched to the sweeter carrots. Jeremy and I liked them, but Nolan only wanted the beef. 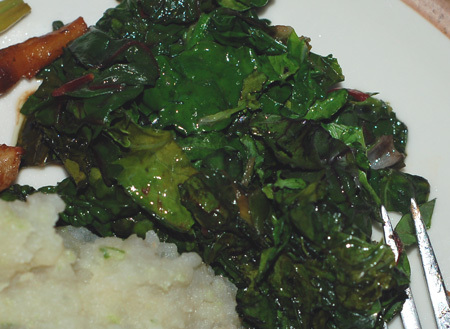 Finally, for something green and vibrant on the plate, I chopped and quickly sauteed a pile of cooking greens with olive oil. These came from a big bag of mixed chard, kale, collards and parsley from Pitchfork and Crow. 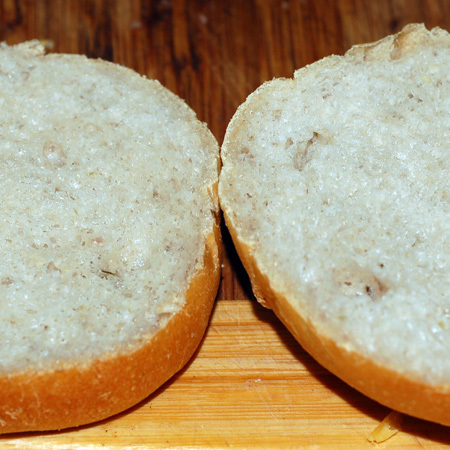 The next day, I used the leftover mashed potatoes to make a batch of rustic potato bread. This recipe from the Macrina cookbook, which I’ve used numerous times, makes enough dough for 4-6 sandwich rolls (depending on how big you like your sandwiches), plus a standard loaf or boule. The bread is lovely and soft, perhaps a bit too much for hamburgers, but just right for thinly sliced roast beef, and the pesto in the leftover potatoes (or garlic, or wilted chard, or rosemary, or potato skins, as was the case for various batches in the past) just adds more character to the finished rolls. I dressed up our roast beef sandwiches with cheddar cheese, leftover arugula pesto and white bean spread, and served them with a handful of baked potato skin chips. These were the brilliant idea of Katie at Kitchen Stewardship. When I washed and peeled the Russets for the mashed potatoes, I reserved the peelings and tossed them with olive oil and salt; when the roast came out of the oven, I baked them at 375F until they curled and crisped, about 20 minutes. 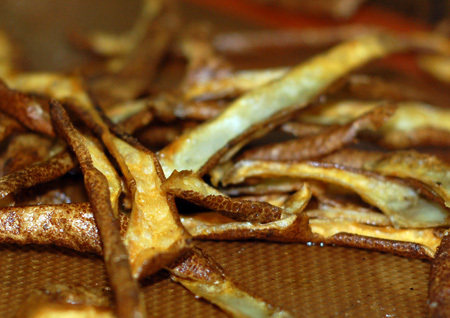 These little snacks, made from peelings that would otherwise have been thrown away, are just as tasty and likely much more healthy than your standard potato chip. This post is linked up with Pennywise Platter Thursday. In a small bowl, combine the lukewarm potato water or whey with the yeast; stir well and allow to sit for 5 minutes. Meanwhile, in the bowl of a stand mixer, beat together the potatoes, olive oil and salt with the paddle. Slowly add the yeast mixture, then 3 cups of flour, switching to the hook when the dough starts coming together. It will be dry at first, then form a moist ball that should nearly clear the bottom of the bowl as it spins. If it seems too wet, add more flour a few tablespoons at a time. Knead by hand or with the dough hook for 10-15 minutes, until the dough has attained a smooth, elastic texture; you should be able to stretch it for about 2 inches without breaking. Form the dough into a ball and place into a well-oiled bowl; cover with plastic wrap and allow to rise until doubled, about 45 minutes. Punch the dough down and divide into two portions. Flatten one half into a rectangle and roll into a loaf shape about 9 inches long; place seam-side down in a greased 9×5 loaf pan. Divide the remaining dough into 4-6 pieces and shape into spheres by forming a circular “collar” with your fingers. Use two fingers of the other hand to push the dough through this collar until it has a rounded top; firmly pinch the dough together underneath. Place on a baking sheet lined with silicone or parchment, and allow the shaped dough to rise for about 45 minutes more, and preheat the oven to 400F. Put both the rolls and the loaf in the oven and bake for 15-20 minutes, turning for even browning if you don’t have a convection oven. At this point, the rolls should be done; center the loaf in the oven and bake for about another 20-25 minutes, until golden brown with an internal temperature of 200F. Remove from the loaf pan and allow to col before slicing. Update 7/7/10: For lunch today, rather than more roast beef sandwiches, I decided to try making roast beef hash with poached eggs and slices of potato bread. 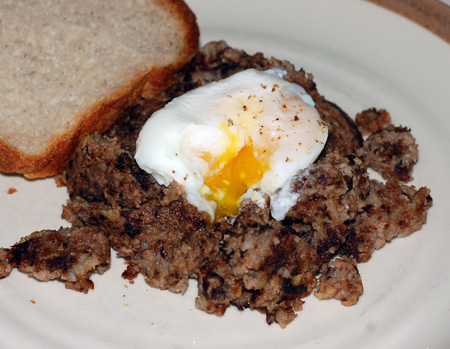 I used equal parts beef, raw onion and red potato, and ran it all through my grinder, according to this recipe’s guidelines; then I fried it up and poached some eggs, trying out Alton Brown’s method for poaching (little custard cups submerged in the acidic water). I’ve never had roast beef hash before and didn’t care for it at all: it was mushy and gritty at the same time, and looked like dog food. The poaching method wasn’t especially successful either, as the cups moved all around when I went to retrieve the eggs, and a lot of the white ended up staying in them as a result. Jeremy ate everything on his plate, but Nolan just gave himself a hash facial and then wolfed down his bread so fast he nearly choked on it. I might like this better if the components had been chopped by hand rather than ground, and better seasoned as well; at least it was an inexpensive way to stretch that roast a little further.